There is a place where casual elegance meets extraordinary surroundings. At The Ritz-Carlton, Cancun, you can surrender to relaxation on Cancun's white-sand beaches or revel in exhilarating nightlife. 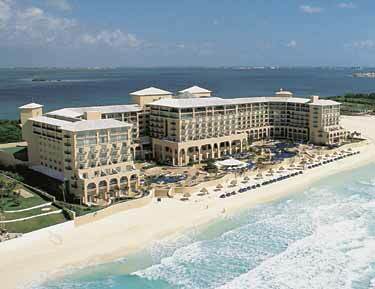 The Five Diamond resort features well-appointed guestrooms, each with a balcony and view of Cancun's azure waters. A stay with us will ensure that the memories you make here will be ones you cherish forever. * Prices are in US Dollars, per person, based on double occupancy, mid-week arrival and may vary with different room occupancy, different length of stay and/or weekend arrival. Discount reflected in the above room rate. These rates are for advance purchase vacation package. Exact pricing may be obtained by booking this vacation. Retorno del Rey Lote 36, C.P. 77500, Q. Roo Mexico, Cancun 77500, Mexico. Spacious guest room with private balcony offering panoramic view of the pool and ocean. Spacious guest room and parlor with private balcony offering views of the pool and beach. Floors 8-9, The Ritz-Carlton Club offers guests the highest level of personal service with five complimentary food and beverage presentations daily in a private lounge. Spacious guest room with private balcony offering direct oceanfront views of the beach and ocean. Resembling a Mediterranean palace, with tiled roofs and shell pink walls, this impressive hotel was built in 1993 and offers 365 elegant guest rooms. Situated facing the Caribbean Sea on 1,200 feet of fabulous powder soft, white sand beach. Near the Kukulcan Shopping Mall and nightlife.